Who's behind the Sno'proof Samoyeds...? My name is Jenni Korpisalo-Kohvakka and I'm 30 years old. I was born in Lappeenranta, a city near the Russian border in South East Finland. I moved together with my fiance (nowadays my husband) Jari to Helsinki because of our studies in 1999. We live in a rowhouse appartment near a little forest and outdoor recreation area. Only Ronja and Zelda live with us, Daisy stays currently at my little brother's home. Daisy, Ronja and Zelda can enjoy such habits as sleeping on the sofa, climbing the stairs up and down and of course get us out for a walk. They are our beloved pets and companions. I have a Master's Degree in Food Sciences (MSc), I studied Food Chemistry in University of Helsinki, in Faculty of Agriculture and Forestry. I studied also Computer Science as a minor. These pages are some kind of a proof of what I can do with computer. My other hobby is to surf around the Internet, do and update homepages and make graphics to homepages. After we moved to Helsinki, it took a year to be without a dog. First came Daisy and seven months later Ronja. Zelda is from my first and only own bred litter. After that I have together with my sister Katja imported two Samoyeds from Slovakia and these dogs live in co-ownership near me. My main interest with dogs are dog shows. I have been attending shows since 1993 and am still very active in many ways. 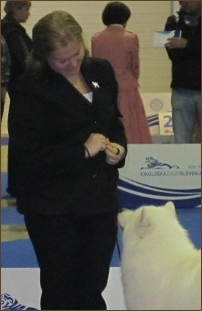 I love to handle dogs, especially Samoyeds. If you need assistance on handling your dog in shows, don't hesitate to ask, I'm more than happy to help! Every dog is different and they can teach me new things. 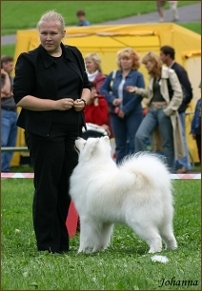 I also keep show training classes for Samoyeds in Helsinki Area, but also other breeds are welcome to join our training group. I'm also a ring steward, which is the other way to be at the dog shows. I have meet different kinds of dog enthusiast and it has opened my eyes to other point of views. I have also trained some agility and obedience, but only just for fun. Breeding Samoyeds will be the new thing for me. I will keep it very small, I try to plan the next litter before the first one is even born and if possible I try to keep one or two puppies co-owned, as our home isn't big enough for having much dogs. And I don't want to have so many dogs at home, it's much easier to have just two or three, that way you can spend much more quality time with each of them. At the moment our breeding plans are on hold, hopefully I'll be able to continue in the future.